"Next the statesmen will invent cheap lies, putting the blame upon the nation that is attacked, and every man will be glad of those conscience-soothing falsities, and will diligently study them, and refuse to examine any refutations of them; and thus he will by and by convince himself that the war is just, and will thank God for the better sleep he enjoys after this process of grotesque self-deception." Click here and automatically subscribe to our free eMail list, emperorsclothes. You'll be sent about one article a day. 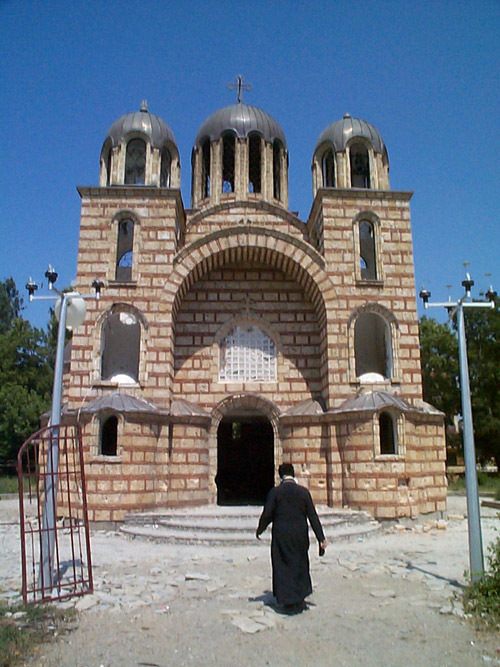 The Serbian Orthodox Churches of Kosovo are not only a treasure of Serbian culture, its roots in the land, not only a treasure of Christianity, masterpieces of an ancient Church. They are treasures of human creativity and many date back many hundreds of years. Kosovo is now ruled by the same Kosovo Liberation Front (KLA) that the US State Department once denounced as a terrorist group. It rules under the protection of NATO troops. In Orahovac, the Dutch NATO troops have removed the barbed wire around the Serbian ghetto; Albanian terrorists are free to drive in and attack at will. The KLA has driven several hundred thousand Serbs, "Gypsies", Slavic Muslims, ethnic Turks and Croatians, Jews and ethnic Albanians loyal to Yugoslavia out of Kosovo. Over 75 Churches have been destroyed. These treasures survived hundreds of years of Ottoman rule, Austrian rule, Fascist Italian and Nazi German/Albanian rule. They have fallen to five months of NATO rule. For some these churches and monasteries were treasures of their Christian faith. For all they were heart breaking treasures of human creativity. 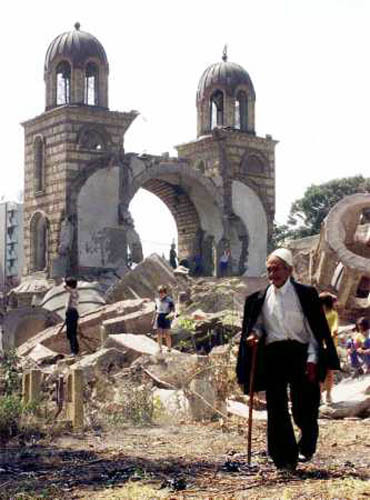 But because they were also a cultural inspiration for the Serbian people, because they constitute evidence that the Serbian people have ancient ties to this land - the churches had to go. Nothing personal. NATO is re-doing Kosovo. Out with everyone not loyal to the KLA; eradicate the signs of their passing. In with gangster rule, and with it, a US military base which, by virtue of its immense size, recalls the War in Vietnam. A look at the OSCE report on violence in Kosovo. International agreements are supposed to provide for the safe return of Serbs driven from their ancestral home in the Krajina section of Croatia. But are they being allowed back? And how are they treated if they do return? In this article George Thompson documents the tragic history of Nazism among the ethnic Albanians of Kosovo. He argues that the racism of many Albanians towards Serbs, "Gypsies" Slavic Muslims, Catholics and Jews became strongly entrenched during World War II when Nazi Albanians (viciously) ruled "Greater Albania" with the help of Germany & Italy. In his introduction, Jared Israel analyzes the different positions on the Kosovo affair and accuses a broad array of individuals and groups of being accomplices to genocide in Yugoslavia. This group includes Noam Chomsky, Howard Zinn, Fr. Sava of Kosovo, Vuk Draskovic, the American Friends Service Committee and many other popular "moderate peace" forces. Mr. Israel suggests that the American "intellectuals" and "peace groups" which he has listed, and others not named, have played a treacherous role, acting to undercut and/or prevent real opposition to US policy throughout the Yugoslav wars of the 1990s and sometimes even providing a warm, fuzzy image for groups in Yugoslavia that have much in common with Nazism. These Yugoslav groups, much like their forbears in the Nazi era, include Bosnian Pres. Izetbegovic's Islamic Fundamentalists and the whole range of racist/secessionists in Kosovo, from Ibrahim Rugova to the KLA. Chomsky, Zinn, Mike Albert of Z-Magazine and these "peace" groups, customarily arrogant with self-righteous humanitarianism, discover humility when it comes to crimes against Serbs, "Gypsies" Jews and others in Yugoslavia, for example the expulsion of 250,000 Serbs from their ancestral home in the Krajina or the current destruction of "Gypsy" and, on a smaller scale, Jewish life in Kosovo. Mr. Israel has urged these individuals and groups to reply. Thus far they are silent. Emperors Clothes will print their replies. Emperors clothes hopes that, in turn, Mr. Chomsky, Mr. Zinn, Mike Albert of Z Magazine, and the assorted "Peace" groups, will facilitate a truly public debate by opening their Websites and publications to uncensored argument. In that way people may judge who is telling the truth and who is lying. The article below refers to the law suit against LM and Mike Hume. That case comes to trial in February. In The picture that fooled the world you can follow the detective work that got LM sued for challenging one of the first campaigns to demonize the Serbian people. Why do you say 'Of course', Mr. Hume? For those of us trying to clear the web of lies which our governments and mass media have woven to deceive us about the Serbian people, Mike Hume is a hero. It is therefore disappointing that he now finds it necessary to add a measure of Serb bashing, as if for balance. Our writer takes him to task, lest it become a habit. There's a storm brewing in Seattle. An AP dispatch talks about citizens' anger at police abuse in that much-abused city. Our writer argues that the AP report is itself an example of abuse: media distortion, a grave threat to democracy. This critique is not empty rhetoric; he shows exactly how the Misleading is done. There's a movement afoot; correction, three. One, now a bit less active than in 1998, opposes the murderous sanctions imposed on Iraq and the routine bombing of that country, once a great, secular Muslim society and, one might note, the biggest obstacle to Islamic Fundamentalism in the Mideast. A second movement blossomed worldwide during the bombing of Yugoslavia. It is focused on the on-going racist terror in Kosovo and the media's demonization of the Serbian people. And now we see there is a third movement, a giant stirring, a Global upsurge of workers, students, farmers and businesspeople against Big Corporate Globalization in general and the World Trade Organization in particular. Can we possibly effect a merger? That third movement is intelligently opposed to Multinational Corporations taking over everything from food processing in Bulgaria to farming in Korea. One especially exciting component is the new student movement in the US. 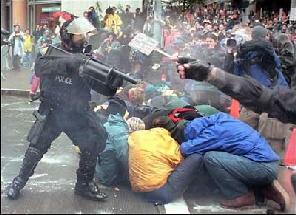 We have not seen passionate student involvement in the US since the old antiwar and civil rights struggles of the 60s. That movement died. Pundits read the obituary. And yet - here its again - decent, smart, principled and democratic. The US government tried to stop it in Seattle. We're betting on the students. Here's an interview with Terra Lawson-Remer, an articulate student activist jailed in Seattle. The Conscience of the King. Desyllas says the purpose was to make "sure there were plenty of photo ops of 'violent protesters.'" Now two readers, T.V. and Alida Weber, have sent us a tantalizing bit of information. It seems Serbian police uniforms have been discovered in a house where the Kosovo Liberation Army (KLA) was stashing illegal weapons. 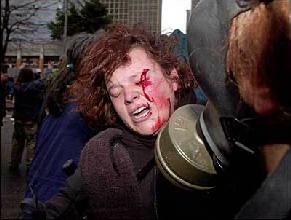 What you may ask could that possibly have to do with staged violence in Seattle? Read on: Masks! We just finished a phone interview with Dr. Richard Deandrea who had set up a makeshift clinic in downtown Seattle. He told us of treating people injured by concussion grenades, plastic bullets, tear gas, pepper spray, an unknown gas that appears to produce muscular seizures, and from physical and mental abuse suffered in jail. Dr. Deandrea insists that what he observed was a real police terror in Seattle. Since we posted this interview we have gotten many emails from local residents and protesters with the same charge. Dr. Deandrea urges us to use email to cut through what he feels is a press blackout on what really happened in Seattle. Our own reporter observed the Seattle police in action on Tuesday and Wednesday. His conclusions are shocking. To read his account, click here Collateral Damage in Seattle. "Outraged at how they've been treated"
A letter from Yale student leader Ben Siegel about conditions of students and others held in the Seattle county jail. Our reporter followed the action in Seattle with an eye to who actually did what and to whom. His report is quite different from what we've seen in the mass media. Coming shortly: "Truth, Status and the American Way - a debate between the two Bulgaria's..."
Now the National Guard has been brought in. Max Sinclair has some thoughts about democracy in America and Yugoslavia.